The study shows that groundwater pumped from depths below 150m in the coastal regions of the Bengal Basin is thousands of years old, and generally secure from contamination by salinity and arsenic found in shallow groundwater. Understanding how deeper groundwater is replenished and how vulnerable it is to contamination from saline and arsenic groundwater from shallow depths is critical to safeguarding public drinking water supplies. "Our results reveal no modern components in deep groundwater with ages ranging from 1,000 to 10,000 years. Traces of modern groundwater are, however, evident in a few pumping wells where they are associated with short-circuiting of vertical leakage within inadequately sealed boreholes," said lead author, Dr Dan Lapworth (UCL Geography and British Geological Survey). The discovery of arsenic contamination of shallow groundwater in Bangladesh in the early 1990s led to arsenic-mitigation strategies that included very rapid development of deep groundwater. There have, however, been serious concerns surrounding the security of deep groundwater to the arrival of both arsenic-rich and saline shallow groundwater. "Until now the vulnerability of deep groundwater has been based on models, which creates a level of uncertainty. For the first time we are able to compare new and historical data from dedicated monitoring sites to those collected from pumped municipal sites, and are therefore able to observe regional vulnerability to deep groundwater contamination from shallow groundwater," said Professor Richard Taylor (UCL Geography). 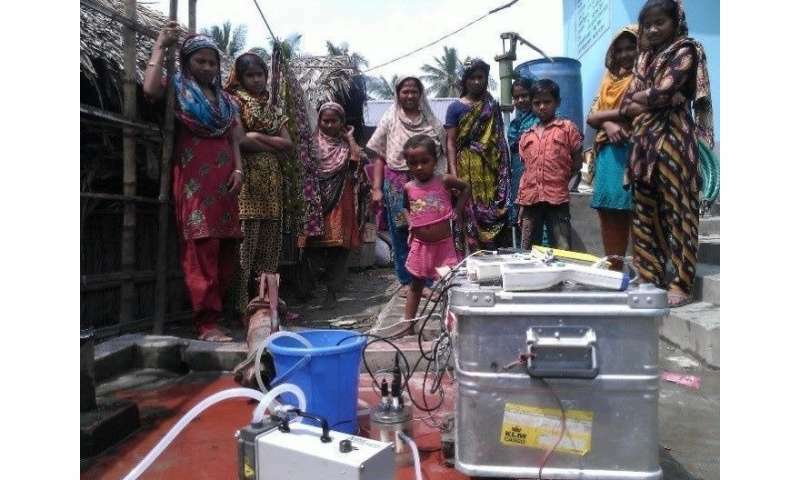 The team, which included scientists from the UK, Bangladesh and India, installed dedicated monitoring wells to characterise regional variations in groundwater across the coastal Bengal Basin to a depth of 360 metres. They analysed chemical tracers, including radiocarbon and chlorofluorocarbons, to assess the age and depth profiles in each. The implications for the coastal Bengal Basin, the largest of the Asian Mega-Deltas which is situated mostly in Bangladesh at the mouth of the Ganges and Brahmaputra rivers, may apply in other delta environments in south and Southeast Asia where deep groundwater provides a critical supply of drinking water to tens of millions of people. "This study supports the case for continued but carefully monitored development of deep groundwater for domestic water supply in the coastal region of the Bengal basin. Monitoring needs to capture both short-circuiting of contaminated water through poorly constructed wells, which may manifest itself over a timescale of years in pumped sites, and vertical leakage induced across the aquifer sediments, which may take much longer (many decades)," said Professor Taylor.